OK so now I can 'let that cat out of the bag' (I bet he feels better!!) 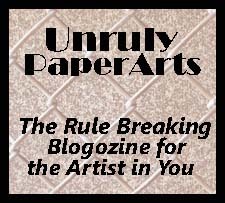 and tell you that I have been asked to be a regular columnist for the brand spankin' new, rule breaking blogozine called 'UNRULY PAPERARTS' and I am so happy to be a member of the team for this new and exciting venture led by Shar (Gingersnap Creations fame). If you haven't yet seen the blog you can find it at Unruly PaperArts (click the link) to find out what it is all about, but not only is it new, it is fresh and different and exciting. So do pop over and take a look. I am going to be amongst some uber talented artists who create the most amazing works of art and together collectively will be sharing an incredible range of styles and genres. Can you tell I am excited? My column will be called 'Eclectic Elements' because that to me is where I am at. I love a range of styles, I love to experiment constantly with new techniques and I adore making cards, altering things, creating canvases and generally getting inky. I hope you will please come and join us when we get started, you will be able to submit articles or projects as a guest contributor, you can participate in one of the unruly art dares and you can read articles, find tutorials and generally immerse yourself in all things arty. The first 'Front Cover' will be coming out on April 1st. Take care and most of all have fun with your art. Many congratulations on your news Brenda and I'm waiting impatiently for this after hearing about it. Almost applied too but not enough time at present. Will love seeing what you come up with for the first issue. Many congratulations Brenda. So well deserved too Sweetie. Congratulations Brenda you will be brilliant and good luck, I will pop over and have a look now. Congratulations! So looking forward to this great venture! Thanks everyone for your confidence in me, you really are helping me to believe I can do this. Congratulations and well deserved Brenda, your artwork is stunning and i'm waiting impatiently for your first column. Hi Brenda...Huge congrats to you! I had read about the new idea...and it really sounds exciting. Looking forward to when it all starts. Congratulations Brenda, thats fantastic news. I am already a follower, so look forward to the launch. Congratulations Brenda, you are so talented, I am looking forward already to seeing your column. WooHoo! I just followed UPA! You will be such an asset and not to mention a fun one at that! Congratulations and have a fun evening! Big Hugs! Congratulations Brenda! I'm looking forward to the launch. Congratulations Brenda. You deserve to be chuffed!! I look forward to seeing you and all the other artists. Enjoy!! Wow Brenda. what amazing news . I am so very happy for you. My shop is now up and running, It is a bit sparse but I m adding new items daily. I will be adding items for altered art too! Congratulations Brenda! Sounds like the perfect fit for your. Have lots of fun! Congratulations, off to check it out! Well many Congrats dear Brenda. How wonderful! looking forward to seeing the new mag! Aww big Congratulations Brenda!! that sounds a wonderful and exciting new venture! Look forward to reading your articles and seeing your wonderful creations!! This sounds exciting. many congratulations Brenda. Congratulations Brenda, they are lucky to have you!! I don't always get time to comment on your beautiful work but I do always make time to have look! Brenda this is such brilliant news, how wonderful, congratulations. A big Congrats Brenda, Of course you can do this. Can't wait to see what you come up with. Congrats my dear! You will be a great addition to the design team! Hi, Brenda.... so happy to get to know you and peek around your blog. Looking forward to working together @ Unruly Paper Arts! Congratulations Brenda ! sounds like an exciting venture and cant wait to visit . Lots of my favourite designers on the team so it should be very inspiring , good luck. I know we are going to have a ton of fun! Can't wait to read your fab column!